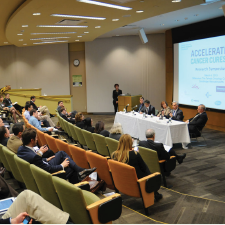 In conjunction with the Accelerating Cancer Cures initiative to speed progress against cancer, the annual Accelerating Cancer Cures Research Symposium is designed to foster communication and collaboration between cancer researchers in industry and academia. Past meetings have included participants from Eli Lilly and Company, AbbVie, Amgen, ARIAD, Celgene, Genentech, Gilead, Merck, Novartis, Pfizer, and Takeda Pharmaceuticals International Co., in addition to academic researchers from the top universities and institutions in the nation. Read more about the Accelerating Cancer Cures initiative. To add to the training potential of Damon Runyon Fellowship Awards, the Foundation hosts annual Fellows' Retreats. These meetings allow the brightest young scientists in the country to interact with their peers, network with accomplished senior scientists and initiate valuable interdisciplinary collaborations. Save the Date for the 2018 Fellows' Retreat. Damon Runyon logo for posters and slides.